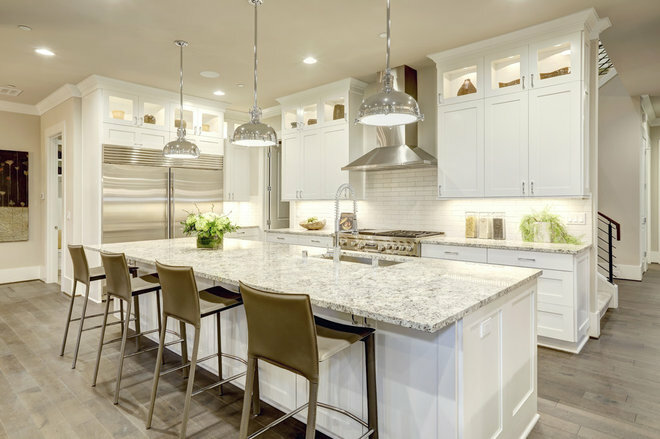 The trend toward kitchens featuring colored cabinets and islands is gaining steam, but the appreciation for the classic white-and-wood look is hardly on fumes. 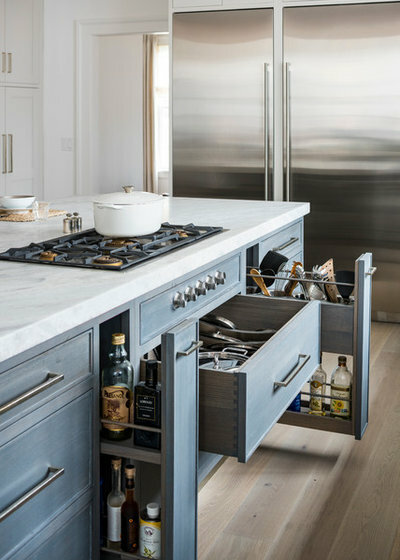 The most popular kitchens cover a mix of traditional, contemporary and rustic styles, but no matter the look, smart storage solutions and functional layouts were definite crowd pleasers. 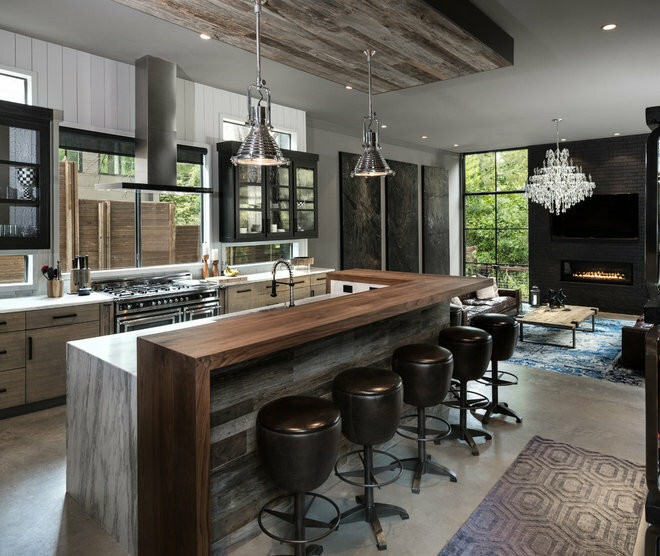 Counting down, here’s a look at the most popular kitchens uploaded in 2017, as measured by how many Houzz users saved them to their ideabooks. 10. Showcase your style. This white farmhouse kitchen in St. Louis scores extra points by leaving a section of cabinetry open to display dishware. This is a great spot to curate based on the seasons or to cycle through your various collections. 9. High contrast. While white kitchens continue to resonate with home design fans, those with more contrast are gaining steam. 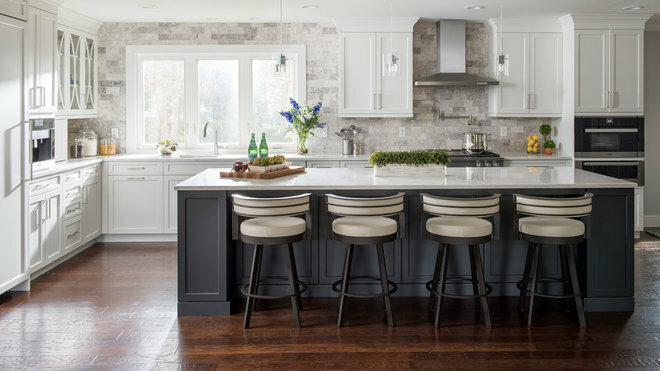 This Pennsylvania kitchen caught a lot of eyes with a backsplash and stools that navigate between the charcoal gray island and the white cabinets. 8. Pretty and practical. 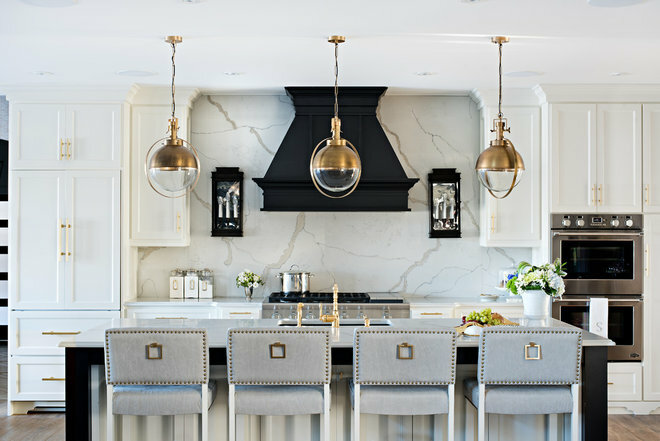 For designer Sarah St. Amand’s own kitchen in Toronto, she selected a stunning quartz for the countertops and backsplash. “I knew I wanted to mimic marble, but marble isn’t the best choice for busy people and families in their kitchens because it’s porous and stains easily.” The quartz she selected gives her the best of both worlds. 7. Your barn door is open. This Michigan kitchen features two barn doors on a single sliding track. 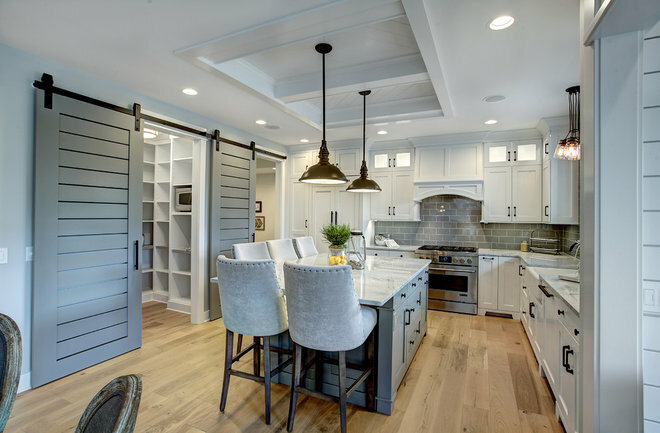 One of the doors slides open to reveal a walk-in pantry, while the other door leads to the living room. Therefore, if the homeowners want to hide a messy pantry or keep guests out of the kitchen, the solution is just a slide away. 6. End-of-island storage. Having a kitchen island with a bar refrigerator built right into it is a design decision that stands out from the pack. Since this picture was among the most saved images of the year, Houzzers seem to agree. 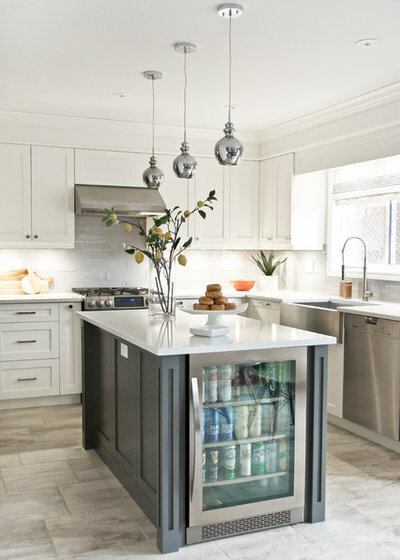 While the fridge here is full of adult beverages, it would also come in handy for juice boxes and other kid-friendly drinks, allowing the little ones to serve themselves. 5. Easy access. With a 2-year-old and a baby on the way, these homeowners wanted a stylish kitchen that was also practical. The cooktop is on the island so the parents can keep an eye on the little ones while cooking. Pullouts on both sides of the cooktop provide space for storing oils on one side and utensils on the other. 4. Natural selection. The heart of this Dallas kitchen is the island-breakfast bar, which features rich materials and a double waterfall structure. The raised breakfast bar is made of warm walnut, while the island top is white marble with gray veining. Homeowner and builder Chris Dauwe covered the space beneath the breakfast bar in reclaimed wood, sourced from a barn in North Carolina. Using natural-looking materials helped Dauwe achieve his goal of “a contemporary home with an industrial twist,” he says. 3. Keeping up with the classics. 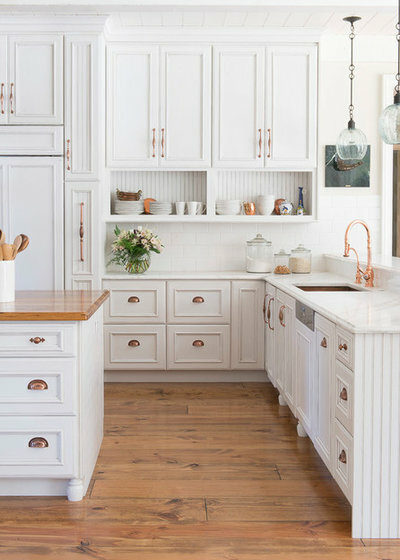 While colored cabinets and islands have been showing up more and more in kitchens, it’s still hard to deny the power of a classic white kitchen. This New York City kitchen, which features white Shaker cabinets, quartz countertops and a subway tile backsplash, is among the year’s most popular with Houzzers. 2. Finding the right mix. 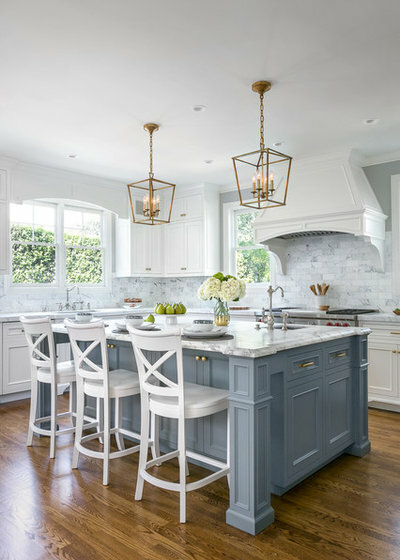 To choose the color of the island, one of the homeowner’s of this kitchen spent many hours on Houzz, sending photos of green, blue and gray cabinets to designer Christine Sheldon until the two finally landed on soft blues. Once they narrowed the choices to three, Sheldon painted those colors on the cabinet surface and then had the colors tinted until she hit on just the right mix. The final paint color is a custom mix from Benjamin Moore. 1. Take charge. Designer Tracey Stephens was tasked with creating a retro-style kitchen that features vintage furniture and checkerboard floors for a New Jersey family of four. But the requirements of the technology age were not lost on the design. 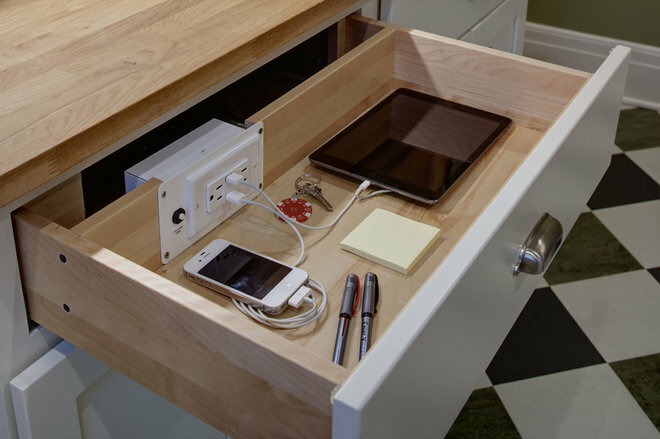 The kitchen includes a drawer with a built-in charger, complete with regular and USB outlets. “It’s so nice not to have all of those devices out and dealing with cords all the time,” homeowner Jody Suden says.